A good news for apparel manufacturers. 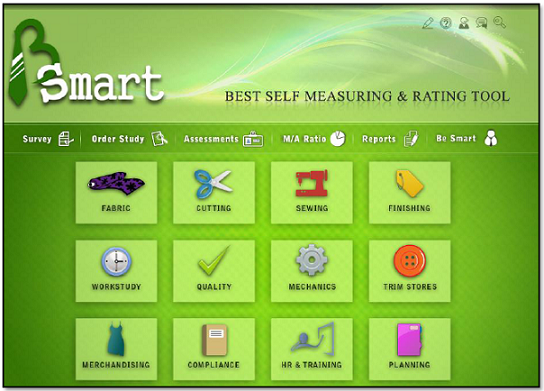 Now and onward apparel manufacturers can measure and benchmark their factory for free. An online tool B-SMART (Best Self Measuring and Rating Tool) is providing the platform where factory can measure performance of its departments. It is a self assessment benchmark tool aimed at empowering apparel manufacturers to measure their performance and assess internal processes and departments in the factory for further improvements. B-Smart has been developed by Methods Apparel. To use this tool first you have to register to this site with your company information. You will receive confirmation mail after submitting your information. Read the user guide for details on how to use this tool and start survey. Once you are logged in you will also get access of video demo on how to conduct a survey. In the following picture factory departments has been shown for which you can conduct a self survey. Watch the following video to know why you should go for B-Smart tool. See where you stand against international and local standards. To know where you are in comparison to the best! Or the rest!